The Sound of the Life of the Mind, the first Ben Folds Five album in 13 years, is finally here. While Ben Folds has had a prolific solo career, there is something very special about this reunion with Darren Jessee & Robert Sledge. 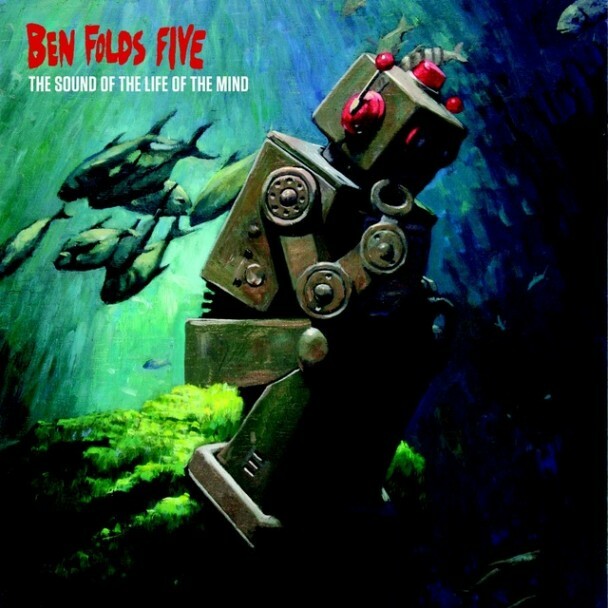 When I wrote about the unique way this album was made, I said "To me, Ben Folds Five has always been equal parts fun & heart...whatever this album becomes, I'm sure it will be that, however it gets in my ears." You guys, I was right. As a VP of Promotions for this album, I received a copy a week before the official release. I've had it for a few days & have listened to it endlessly. It's beautiful, & lucky for you, the songs are streaming now. I guarantee you'll be singing along. Fireworks. Erase me, so you don't have to face me. Put me in ground and mow the daisies. Listen to "Erase Me" here. "Michael Praytor, Five Years Later" boasts a killer bass-line, soaring falsettos & jazzy piano. Everyone has someone they keep running into over the years. Michael Praytor is that guy. while others disappear into the sky? Dance to "Michael Praytor, Five Years Later" here. "Sky High" has a relaxed 80s Marc Cohen/Phil Collins/Don Henley feel. One of the 2 Reinhold Messner-like songs on this album. Lyrics by Darren Jessee. Pawn shop billboard: "We Buy Gold". Old dreams just fade and twist; it's a heartache that never ended. Listen to "Sky High" here. The title track is a pulsing epic with lyrics by Nick Hornby, left over from his collaboration with Ben Folds, Lonely Avenue. The song tells of a girl who isn't quite ready to leave school behind. Sara, well, she just can't bear the stupidity, the boredom, the grind. She stays at school so that she can hear the sound of the life of the mind. Listen to "The Sound of the Life of the Mind" here. I can imagine Sinatra's version of "On Being Frank" in my head, & it's heartbreaking. And it's a long way from the dustbin of New Jersey to the top; Who would have known? Listen to "On Being Frank" here. And then listen to it again, because it's stunning. but I had to settle for this vanilla thunder. Taste the vanilla thunder & listen to "Draw A Crowd" here. There will be times you might leap before you look. There'll be times you'll like the cover and that's precisely why you'll love the book. Listen to "Do It Anyway" here. From the second the drums kick in, "Hold That Thought" clips along like a train. A mellow train, similar to "Brick". I like this one more & more with each listen. The Chinese doctor took her arm, gazed at the floor & read her wrist for the secrets in her mind. 'Here's your medicine', she said, 'If you not smile at him, then someone else will'. You hold that thought, & I'll hold that thought, too. Listen to "Hold That Thought" here. "Away When You Were Here" is another gorgeous eulogy, this time for a less-than-ideal Father. Fresh white snow for miles, every footstep will be mine. you'd have made my Wedding day. Listen to "Away When You Were Here" here. Guess I thought it wouldn't happen, that I could care until it hurt. And the ironic timing, the clouds & their linings had opened up & poured. Thank you for breaking my heart - now I know that it's in there. What a fool to imagine that you'd feel the same, but you know better. Weep along with "Thank You For Breaking My Heart" here. Equal parts fun & heart, & it's cool to know that my contribution to the Ben Folds Five pledgemusic campaign helped this album become what it is. The Sound of the Life of the Mind is released on Tuesday, Sept. 18. Pre-order it here.